The four-week Yoga TTC program with Mike Narada held at the Mahabodhi International Meditation Center in Leh, Ladakh is a challenging and fun program that will deepen your personal yoga and meditation practice, provide you with the teachings and resources necessary to become a capable yoga teacher, and bring balance and calmness to your life. The program structure and small-class size is designed to give students the opportunity to grow personally and leverage the wide variety of experiences from the highly capable and caring staff. Mike Narada has over 25 years of experience in yoga practice and is a dedicated, understanding, attentive, and inspiring teacher. Effectively, itʻs a lot of questions, but I do understand your feelings re. the Yoga TTC held at International Mahabodhi Meditation Centre of Leh, Ladakh, so Iʻll reply you patiently, and am sending a copy to Mike Narada Wonhe who is now a beloved friend. 4. Mikeʻs Yoga TTC cursus includes 7 items from morning 6h30 to evening 18:30h/20h. Except 2 items with only the TTC students & the 2 teachers, all the other items being included IN the great public Sangha activities, and itʻs unique in the world !! Mike leads beautifully the Vipassana Meditation of morning & evening, and I loved it particularly... as I practice meditation since 20 years now, and my own house is a YogaMeditation Centre since 2 decades. I attended that TTC in Leh as a refreshing course, and have been absolutely delighted by it !! And Mike is a wonderful, attentive, and very dedicated Yoga teacher who lives first by example. 1. Yes, Leh is a beautiful place to be in Summer, i.e. June-July-August. Itʻs also a very dry place, as very little or no rain in Ladakh. So, better have a lot of skin & nostrils creams to moisturize, and drink there a lot of water... or herbals (what I did everyday). 3. I was in Ladakh 2 months (25th June to 25th August 2016) and followed the July 28-day TTC. Itʻs Summer, perfect mild temperature of the Himalayas. For the TTC, no lessons outside in nature, but all indoor at Mahabodhi Centre of Leh, except the 3-day retreat at the main Mahabodhi Centre, 8 km away... Surprise, but beautiful surprise !! 5. Me, as Iʻm a basic traveler (bis), Iʻve taken a very simple accomodation for IND Rs350 per day with shared bathroom & toilets. Mike guided me on that topic, as he knows Leh very well. But you have a great variety of accomodations in Leh that you can take time to choose if you reach there at least ONE WEEK BEFORE (which Iʻll highly recommend because of AMS or Acute Mountain Sickness symptoms... normal at that high altitude and which need some days to acclimatize). 6. Maybe there are other schools giving TTC courses in Leh, Anne, but I never inquired for that because I was so happy to have met Mike & his Gaiatree School (with also Shashi Putel, his young cute Indian Yoga assistant & teacher). I absolutely recommend to follow that Yoga TTC which has been so beneficial for me, even if I was already teaching YogaMeditation since so many years before. Hope you are happy of my answers, Anne !! Wishing you the best on your Path. Much Love and Light !! After many years of more or less regular yoga practice, it has "joined" this year for the YTTC from 01.06.2015- .28.06.2015 in Leh/ India. I had planned just by four weeks of intensive yoga practice, and the only for me. Youʻve managed to inspire me so that I have found after the very intense four weeks training little by little fun with it, itself to teach yoga. I have received in the four weeks a very challenging yoga practice through you, a very interesting anatomy lesson by Anke and a lot of help by Shashi. I gained a lot of new experiences, had a lot of yoga practice, a lot of fun and got a lot of ideas and suggestions. Your Yoga was very challenging for me, but I never felt overwhelmed. Youʻve also shown me where my weaknesses are, and where I still need to catch up. Even the Meditation Retreat in Choglamsar was an very good experience I would not miss. So as a conclusion: Four very beautiful, exhausting weeks for me, very good accommodation, good tips and help, even during preparation, everything well organized. I have a very short time felt as if I am at home in Leh. For all of you thank you again. "Gaiatreeschool yoga retreat was the perfect way to end my 2014. Spending the last 5 days of the year in silence, going within and just being with myself in the waking hours and through the meditations while nurturing the body through yoga, was the best gift I could give myself. The location of the retreat was also absolutely beautiful. It reminded me to be thankful for being alive on this beautiful Earth." 6 days Yoga and Vipassana retreat with the honoured Ajarn Mike Narada in Ban Bourtong have been a both challenging and purifying experience for both my body and mind. Ajarn Narada was mindful and attentive to both newbies and more experienced participants, so everyone learned a lot. The unique Gaiatreeschool combination of yoga and meditation was very powerful. The location – in the middle of the forest, but close to a village and hotsprings – was simply perfect. And, being a food lover, I will never forget gracious Noi and her staff, who prepared the most delicious vegetarian meals for us. In conclusion, I am – weeks after - still really happy about this retreat experience. Hence, I can recommend this retreat to anyone, who would like to get control of her/his restless mind and a stronger, more healthy and agile body. Gaiatreeschool indeed improves and rocks you! 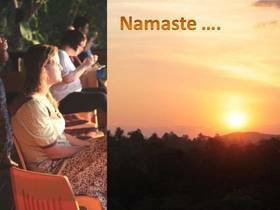 The retreat in Banbourtong Thailand was truly a magical experience. I have done many yoga and meditation retreats, each are unique and each stick with you the rest of your life. This was an individual journey; a spiritual cleansing even if you are conscious of it or not. Every day life can drive you away from perspective and a retreat like this helps get you back on track. It also gives you the tools to create new habits and ways to bring more peace to every day life. Our mind is a muscle and Mike helps jump start the work out; to observe and control your daily reactions. It is evident that Mike lives and breaths these teachings - they are rooted in wisdom and authenticity. He bring decades of experience from all over the world and from the source of yoga - India! The yoga covers all kinds of styles and is customized to the students - it is not easy that is for sure, but nothing that is worthwhile is. I am a certified yoga teacher and not only learned a lot but was challenged. We also had students that have never done yoga and they were able to successfully learn. Learning Vipassana and taking silence for a week was obviously difficult but not at the same time. It was peaceful, and necessary to really learn and go inside. The retreat schedule was full from morning to night - from classes, to walks, to hot springs trips, to massages and fantastic food. I enjoyed the intense schedule and thoughtfulness of the flow; you can tell everything was built to teach you from the ground up, it was well structured and came from love. The house was rustic, the location peaceful and the staff were beyond sweet. This was home for a short time but will be a life time of memories to help find our way home when we get lost. I highly recommend considering a retreat with Mike! Thank you again for a wonder end to 2014, I am beyond grateful!